Mike and Karen Hartley have made a generous gift of $1 million earmarked for the creation of the Hartley Academic Resource Center for the development of Eagle student-athletes as part of the Alico Arena expansion and enhancement project. It’s the third seven-figure donation to Athletics’ $12-million and allows for construction to commence. The Hartleys have been active members of the Eagles Scholarship Society — the highest annual giving designation for FGCU Athletics — and have been basketball season-ticket holders since 2014. 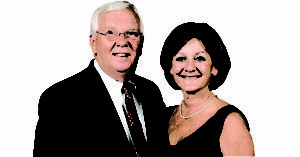 The couple have been supporters and boosters of FGCU Athletics and active volunteers for Night at the Nest, the department’s largest and most successful annual fundraising gala. The Hartley Academic Resource Center will be on the first floor of the Alico expansion, closest to Swanson Stadium. It will include offices for the Student-Athlete Learning Center’s staff, work spaces for group projects, numerous computers lining the glass exterior, seven private tutoring areas and living, study and conference rooms. Other Phase I enhancements include an expanded sports medicine area, the addition of new men’s and women’s basketball suites and the reconfiguring of office spaces. Phase I is scheduled to be completed in time for the start of the 2017-18 academic year. *For more information about donating to the Athletics campaign, contact Assistant Athletic Director for Advancement Graham Diemer at 239-590-7117 or [email protected].